I’m truly amazed at how busy I’ve been since quitting my job. I still feel like there aren’t enough hours in the day, so I don’t know what the heck I did before! I’ve definitely been cooking a lot more, and with cooking comes shopping and cleaning up. I’ve also been running, working out and yoga-ing. I was doing that before (minus the working out), but it was a lot more rushed. I’ve been getting to projects that I’ve put off for months, if not years. I’ve been catching up on a lot of blog stuff and attempting to work on my social media skills. I’ve been working alternately from my kitchen and from Panera, but I find I’m much less distracted at Panera. I’m planning to redo my home office so it’s a more useable space and more inviting than the kitchen counter! I’ve also been seeing friends a whole lot more which is a really, really nice change. So… so far, so good! Not bored yet! Today is a special day… it’s Secret Recipe Club day! The Secret Recipe Club is a group of bloggers who, every month, get assigned to another blog from which we must choose a recipe to make and blog! Assignments are a secret until reveal day (today!) when we all post our chosen recipes. This month I was assigned the blog Oh! You Cook! It’s written by Dena who is librarian by day and blogger by night. She’s even written a cookbook– The Everything Kosher Slowcooker Cookbook! Anyone who has a cookbook has got to be good! One thing I noticed immediately on Dena’s blog is that she has not one, but three butternut squash soup recipes!! Going into my assignment, I was totally feeling soup. It’s been chilly and foggy here every day since we got back from vacation, and soup just sounded good. I spotted Butternut Squash Sweet Potato Soup and it sounded amazing. But then I saw Butternut Squash Soup with Mango… and then Amaretto-Kissed Butternut Squash Soup! How to choose, how to choose? Dena mentioned that the amaretto-kissed version was the “world’s best butternut squash soup.” Between that and the fact that I love everything almond flavored, I had to go with that one. And I’m so glad that I did. The soup came out amazing. Creamy and velvety. I was afraid the amaretto flavor might be too overwhelming, but it wasn’t at all. It just gave a very slight hint of almond aftertaste. So perfect. Toss squash, carrots and onion with 2 tablespoons of olive oil. Spread evenly on one or two baking sheets. Roast 25 minutes until squash and carrots are softened and lightly browned, tossing once halfway through. Remove baking sheets from oven and set aside. After about 15 minutes of roasting, heat remaining olive oil in a 6-quart or larger pot over medium heat. Add garlic and thyme, and saute 30 seconds to release flavors, then carefully pour in the Amaretto. Bring to a boil, then simmer a few minutes until Amaretto is reduced by about half. Stir in stock; cover and bring to a slow simmer. Stir in roasted veggies. Re-cover and return to a simmer. Reduce heat to low and simmer for 10-15 minutes or until squash and carrots are very soft. Use an immersion blender (or transfer the soup to a regular blender) to puree the soup until there are no lumps remaining. Remove from heat and stir in heavy cream. Season with salt and pepper, to taste. Serve topped with pepitas and alongside some crusty bread for dipping! Need a dipper for your soup? Check out Dena’s No-Knead Potato Breadsticks. They look fantastic! This looks wonderful! P.S. You will never be bored =) Happy freedom! I’m glad you enjoy staying home. I do too! And yes, somehow the day flies by. Soup was a great choice. Soup with booze even better! Oh wow! I absolutely adore amaretto. Never thought to put it I a soup. Sounds amazing! I know… I thought it sounded really INTERESTING! LOL… but it gave the soup such great flavor! I often say I don’t know how I found time to work. It is amazing how busy we are every day. Great soup choice. Can’t go wrong with Amaretto! This looks and sound AMAZING! 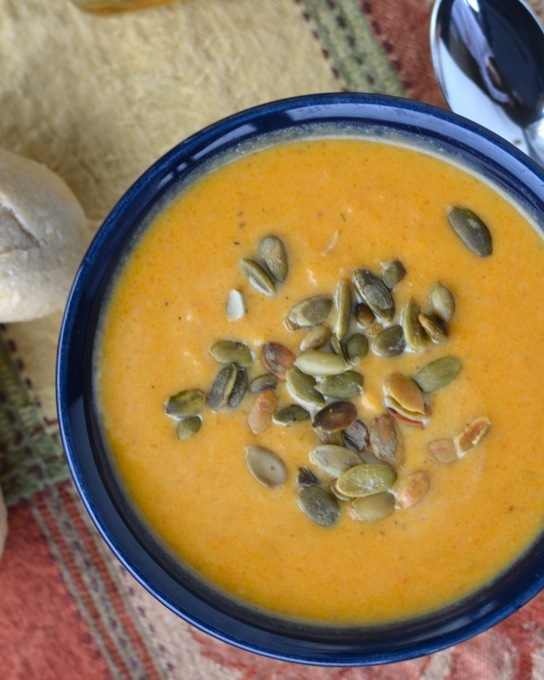 I love butternut squash soup but I haven’t made it at all this year…that needs to change! Definitely!! It’s such a yummy one! And so easy! Congrats on the new life you’re creating!! I retired a few years ago and wonder now how I ever found the time to work. This soup looks so, so good – very cool idea to add the amaretto. The texture looks like velvet! Thanks, Susan! I am excited to see where this year takes me. This soup was SO smooth!! Soup would be perfect with this dreary weather. Love the addition of amaretto. Great pick! 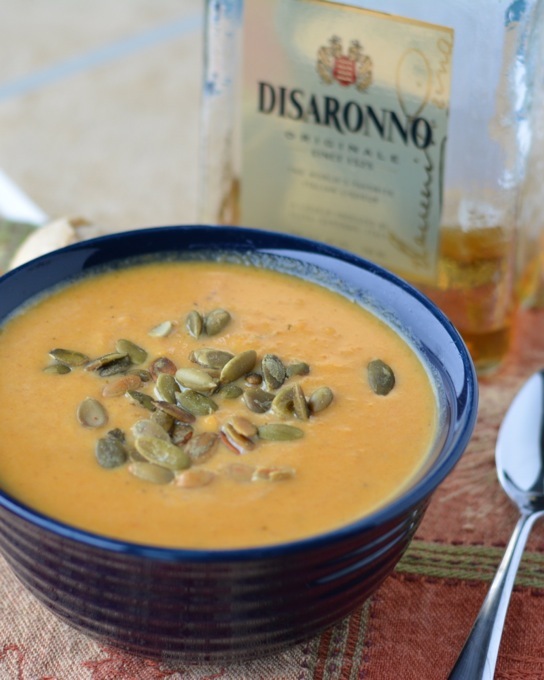 Love the use of Amaretto, what a nice twist on a butternut soup! I am not sure we have any in the house, though. Gotta search and make a note to self to get some! I need to get a good bowl of soup with all of the snow we are getting tonight. This recipe looks like a winner. Happy Reveal Day! What a great choice! I love amaretto, and can tell I would love this soup. So pretty, too! I’m so glad you’re enjoying yourself, Jess! I’m sure it’s such a relief to be on your own and away from your previous job. This soup looks fantastic! I’ve never had a butternut squash kind before, so I’m loving this flavor combination. And the amaretto in here sounds fantastic! Love your creativity, friend! I’ll tell you, I thought once my kids were in school all day I’d have tons of time on my hands, but it goes so fast! I don’t know where the day goes half the time! At least you’re doing what you love and I have a strong feeling you won’t get bored. 🙂 I love butternut squash soup, and adding amaretto sounds amazing! The pumpkin seeds are such a great garnish, too! It is getting super cold here…I could use a bowl of this soup right now 🙂 Great SRC pick! Wow, what a unique soup! I have been loving butternut this winter, and am so intrigued by the amaretto! Looks delicious! I never would have thought to put amaretto into pumpkin soup – I’ll have to remember that one! Lovely choice this month! This soup really is my favorite of the three, but that could just be the Amaretto talking 😉 . Glad you enjoyed it! Oh my goodness. I love butternut squash soup and amaretto. How cool that they go together in one! I’m glad your time not working is going well! I have to admit that I’m totally envious! I never would have thought that butternut squash and amaretto would go well together, but this soup looks amazing! I love butternut squash, but haven’t tried it in a soup. I think that needs to change though because this sounds delicious! The amaretto sounds like a great addition too. I am definitely going to make this soup…it sounds absolutely delicious! I also love anything almond flavored!!! That liquor smells so delicious so I can only imagine how delicious it is in the soup. I’m a huge fan of butternut squash soup too! I’ve never has amaretto! This makes me really curious now. Great pick. Sounds so interesting. I love butternut squash soup, and I can just imagine how divine the Amaretto made it. I’ll have to try it one day.